(NBC) A massive fire engulfed the historic Notre Dame Cathedral in Paris on Monday, causing the roof to collapse, destroying a spire and bringing many onlookers to tears. At least one of the church’s spires has fallen and France 24 reported that the roof has collapsed. The massive blaze also spread to one of the church’s landmark rectangular towers. Flames could be seen blazing behind an oblong stained-glass window in one of the towers. Four hundred firefighters were on the scene, desperately trying to douse flames that were destroying one of the nation’s most treasured sites. Onlookers were in tears as they witnessed flames destroying one of Paris’ most famed and popular landmarks. 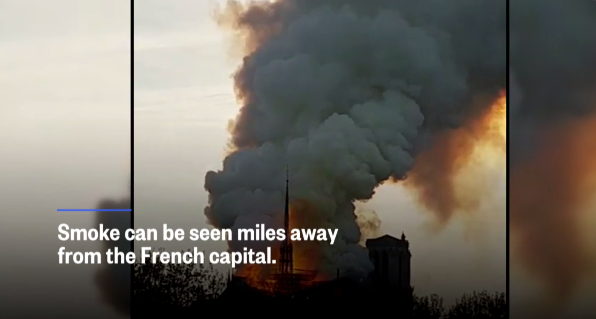 Another witness, Nicholas Marang, was running by the River Seine when he spotted smoke — but didn’t immediately realize Notre Dame was on fire. He whipped out his phone and took footage of the spire’s fall. “[The cathedral] is beyond countries, that’s beyond anything, that’s part of our growing up, it’s a part of our culture, it’s apart of our lives,” said Trump, who was speaking at an economic roundtable in Minnesota.